The Standard Dock for MOTOROLA XOOM lets you use your tablet at a convenient angle while it charges. Stay charged while you access your apps, watch movies and shows, view photos or listen to music. Set the default view to clock mode, or add some pizzazz with images from your photo gallery. In the Box: Standard Dock Additional Adapter Plate, Compatible with Motorola Protective Gel Cases, Rapid Wall Charger Quick Start Guide. Let the Motorola XOOM ecosystem redefine the line between your laptop and your smartphone. With a suite of smart accessories and the unique webtop application, you now have the freedom to access and manage your files, photos, emails and the web on a larger screen with a full keyboard, virtually anywhere you go. The Motorola XOOM is the first smartphone with dual-core processing and webtop, an application that mobilizes your desktop. And with compatible accessories designed to get the most out of the XOOM, you will learn just how brilliant a smartphone can be. Expand your mobile experience even further with this Standard Dock for the Motorola XOOM. The Standard Dock charges your XOOM as well as giving you a comfortable viewing angle for watching video or viewing photos and documents while it charges. Plus, when you dock your Motorola XOOM, the phone remembers your preferences for a customized experience. Customize your device so your favorite features are always accessible. HD Multimedia Dock--With a Standard HDMI port and room for up to three USB devices, the HD Multimedia Dock for Motorola XOOM is the definition of versatility. Add a keyboard and the webtop application to the mix, and you'll be able to work or play on a large screen--the way you like it. HD Multimedia Dock Bundle--Empower your day with the HD Dock Bundle for Motorola XOOM. Work smarter, communicate faster and browse like never before. Includes an HD Multimedia Dock, Wireless Keyboard, Wireless Mouse, Remote Control, and an 18W Wall Charger. 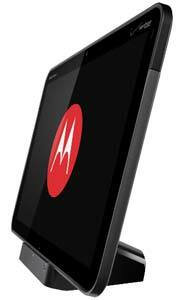 Car Mount--Use the Vehicle Dock for Motorola XOOM for a driver-friendly interface and voice-enabled search and dial. Get real-time traffic information and full turn-by-turn navigation from Google Maps Navigation (beta). You can even connect to your car stereo safely, in a snap.